Building knowledge and capacity on using the FREEWAT platform, aiming at improving the professional level of technical and managerial personnel involved in Water Resource Management issues in public institutions and companies (stakeholders of the project) is the goal of WP3. In Task 3.1 trainees were asked to perform self-training on QGIS GIS desktop and to perform tutorials for the hydrological part of the platform, to gain confidence on the software instrument and to provide the developers with feedbacks on functionalities and bug fixing issues. A total of 97 participants took part to the self-training activities; among them, 42% came from the research and academic world, while 58% from other kind of institutions. It is worth mentioning the relevant participation of geoenvironmental companies (21%, mainly SMEs) and governmental institutions with roles in water management issues (18% of the participants). In addition, a total number of 42 students took part in the self-training activities, both as part of the Core Training Groups or within MSc courses in 8 different countries. A relevant milestone reached is that FREEWAT starts to be used as tool for delivering classes in MSc Courses. A total of 55 Institutions were involved in Task 3.1 in 20 countries both EU and non-EU. 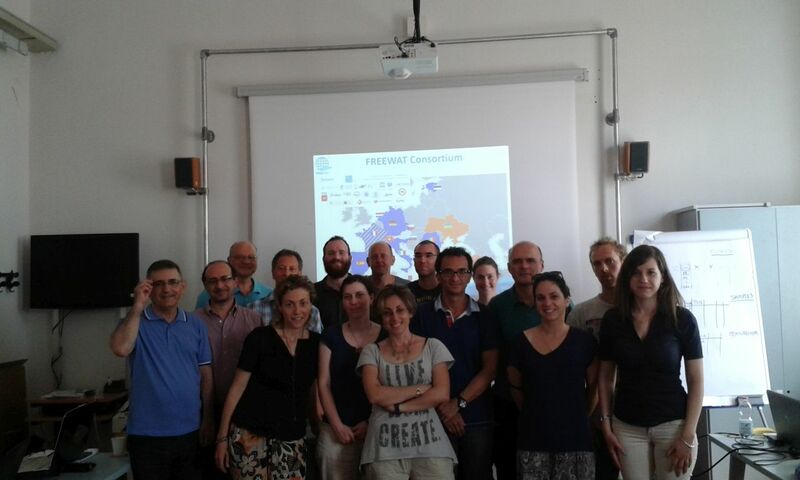 Finally, it is worth recalling that a basic course using a very preliminary version of FREEWAT (course title: FREEWAT: open source groundwater modeling integrated in GIS environment) was given as pre-congress course at IAH 2015 in Rome on September 12th 2015 and attended by 19 participants (further info at: http://www.iah2015.org/pre-congress-courses-and-workshops/#3). From May the 1st 2016 to end of July 2016 one week training was delivered at the premises of each case study partner (SSSA, UNESCO, METCENAS, ZETA, RT, IEI, ERU, NTUA/AMD, INHGA, PRN, UTARTU, TSNUK, BUGS, SUPSI) by the FREEWAT Steering Group (SSSA, TEA, TUDa, IDAEA-CSIC and SUPSI). The specific objectives of these courses were: 1) to demonstrate all the platform capabilities and its potential application to each case study, 2) to serve as testing phase as functionalities implementation are completed, 3) to serve as the basis for building capacities at national level in further phases of this project (Task 3.3). The course included several lectures on the different modules of the FREEWAT software platform, including a theoretical part and a set of exercises to practice the capabilities of each module developed. Participants to these courses provided several suggestions and feedbacks that have been taken into account for the release of version 0.3.2 of the FREEWAT platform and for the final version of the training material. A total of 99 people (excluding MSc and undergraduate students) participated in various Training of trainers courses; among them, 37% came from the research and academia and the rest from other entities, such as: the 24% from governmental institutions with roles in water management issues, the 17% from geoenvironmental companies, the 6% from environmental agencies, the 2% from water utilities and 5% from River Basin Authorities, while a 5% were professionals belonging to local authorities involved in water management and 4%. Furthermore, a total of 8 MSc students and 1 undergraduate student participate in these courses. A total of 50 institutions from 17 different countries both EU and non-EU were then involved in Task 3.2. The present version of the training material is a compilation of lectures, tutorials and exercises oriented to demonstrate the FREEWAT platform capabilities.